Let's go for a drive on a beautiful Sunday afternoon.There must be room in my car for all of you. It may be a chilly day, but the sun is shining and the roads are in good condition so off we go. 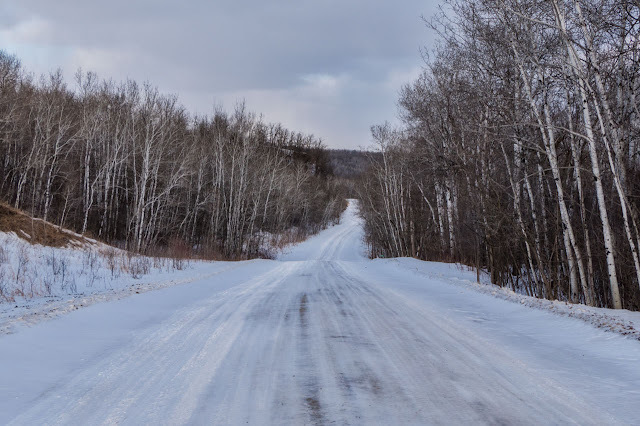 We head north of Morden and then turn west, through the small community called Miami,no not Florida,but Manitoba.Just a little further west and then we turn north again along a country/gravel road. 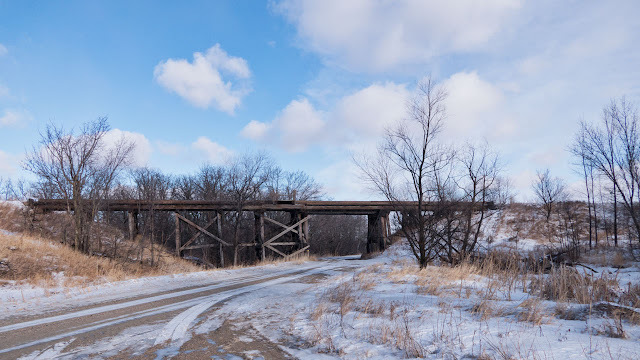 We make a left turn and go about a mile west to see this old railroad trestle. Right near the trestle,I turn my camera to the north and capture this scene.Simple yet pretty, in my mind. Back we go to the main road and turn north again. I have passed this old building many times and have taken a picture or two,but I need to make another stop.Here is the colored version. This is the same picture as the previous one, only in black and white.Which one do you prefer? Now we make our way to a picturesque valley, known as the St. Lupicien valley.There is a very small hamlet by that name.Today I will not show the valley so much but rather a few views that caught my attention. I like this fence line fading off into the distance. As we drive, this is often what the view ahead of us is. Somehow this scene has added beauty in winter, although,I'm sure it would look great in summer as well. Those white Birch trees have a special beauty about them.I hope you are enjoying this drive as much as I am. I'm thankful that I can have my friends along for the ride. 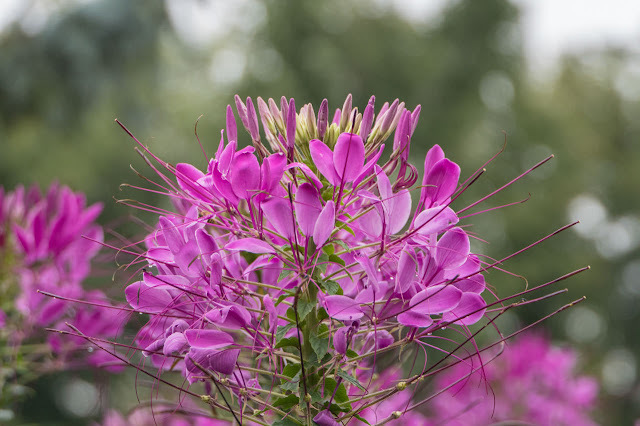 You have all been such wonderful company so I thank you with a summer photo of this Cleome. I hope that we can do this sort of thing again. You don’t always see them,but,you know they’re always there! I loved our drive! And you know all the best places. 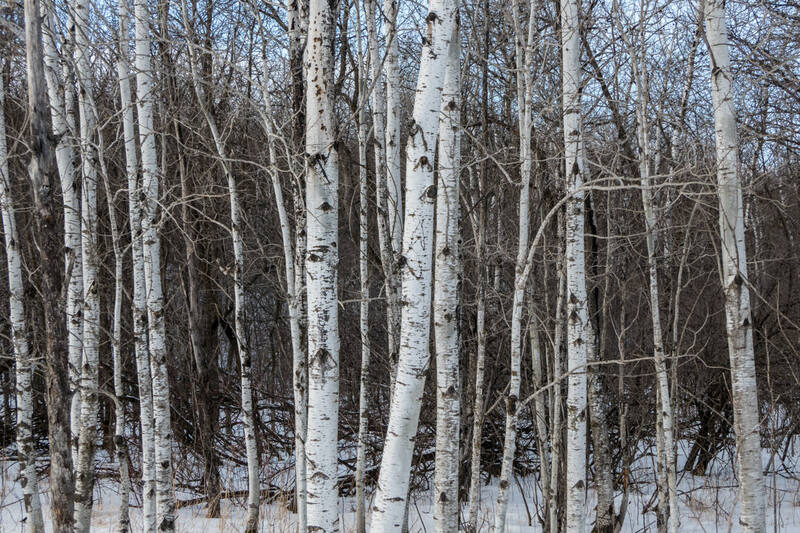 I have always loved birch trees, and these are beauties. The little house, is it full size? Or would it be for some animals? It is a beauty. I like the color much better, because of how the green really pops in the picture. The tree beside it is just as beautiful. 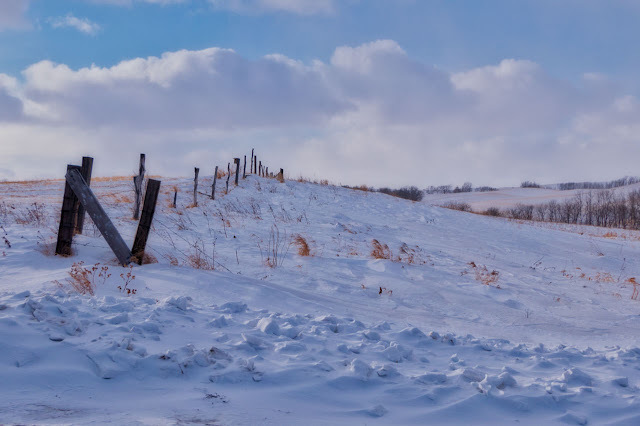 And I love the fence that goes on forever in the blue tinted snow. I am always too chicken to go out driving in the snow, so I am glad to go with a professional driver. it was not even crowded in your car, you must have a large one. LOL... I love the photo that you did in color and black and white. i prefer the color, it looks like black and white with just a hint of mossy green. so beautiful. photos 2 and 3 are gorgeous and would be beautiful on canvas and on the wall... the snow with the fence could be a beach in our Miami. Thank you for taking us along with you on your Sunday drive -- the scenery is gorgeous. i like both versions of the photo of the tree and old building. The black and white is more somber and better highlights the age of the subjects. The old green shed is a great subject. If we took the school bus, that would surely fit all of us! These are some beautiful images Ruth, you live in an extraordinary area! You took some great pictures while on your drive. I felt like I was there. Thanks for sharing them! That was a lovely trip, thanks for letting me tag along. Glad you were driving, I am out of practice driving on ice! I love the wintry scenes, and I think I like the colored barn better, but both views are pretty. Have a blessed day! I certainly did enjoy that ride with you. 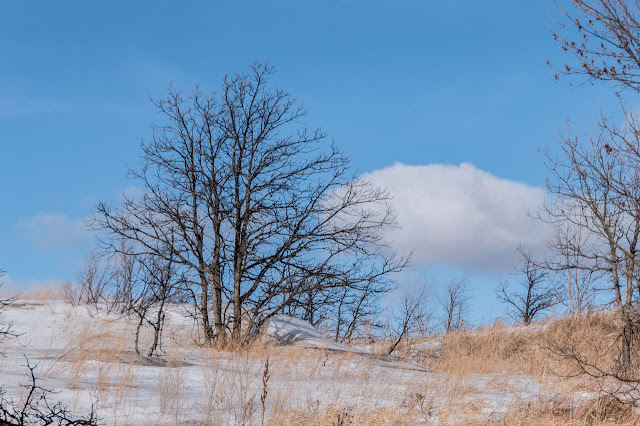 You captured beautiful winter scenes. The second one is my favorite. I loved the birch! And the winter lane would be gorgeous in any season. I'm with you on the perspective of the vanishing fence! Hot chocolate treats are 'on me'!! Ruth, beautiful images! They are very special. I think I prefer the colour to the B&W! I think I've looked at so many old B&W's that I have come to really enjoy a colour shot. The B&W is nice in it's own right! 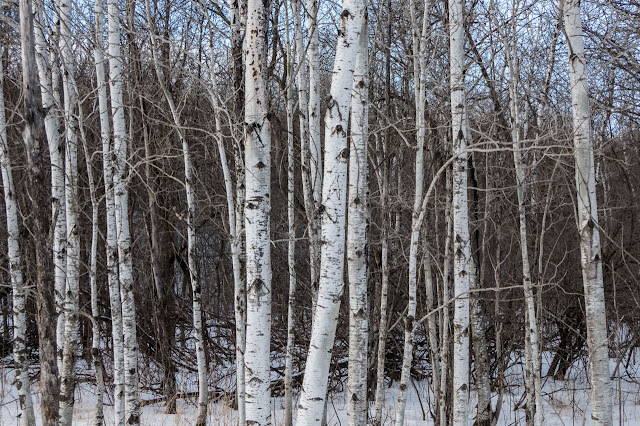 I always like the shots of a forest of Birch trees! I enjoyed the ride thank you. Very lovely. I like the birch trees. Barn shots, coloured or white are always nice. I love that shot of the road lined with birch trees, as well as the next shot providing a closer look at the tree trunks. Those white trunks are so beautiful to see. 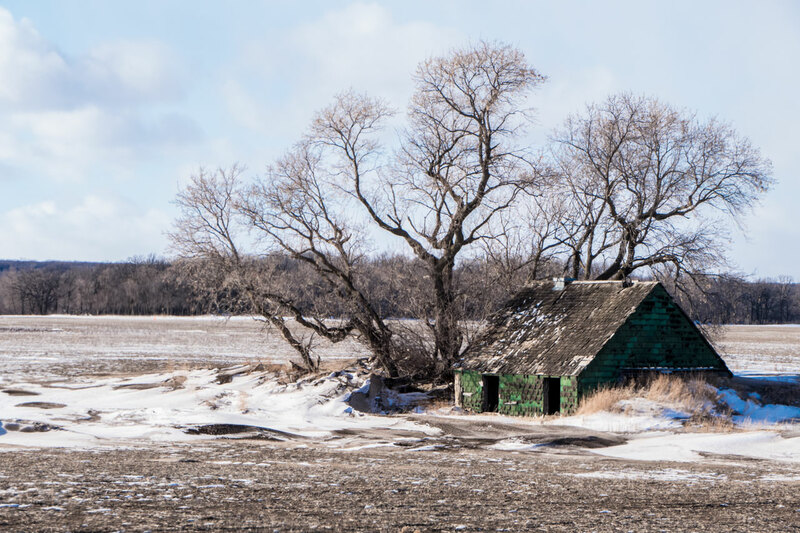 I really enjoyed the drive; thank you so much....I always seem to prefer color so I really like the capture with the broken down house. When I see a house like this, I always wonder about the people that have lived there and the memories they made.... Such a pretty scene. And those birch trees are just gorgeous. I prefer the color shot as th B&W lacks contrast. Other shots are so lovely!! I enjoyed my ride along with you, Ruth. There were many beautiful views. I can also tell you are a safe and careful driver. Thank you! A thoroughly enjoyable drive along the lesser known roads and rural areas, Ruth! Gorgeous scenes and photos and I think I prefer the colored version better of the old building. Looks like a very beautiful and wonderful ride! Love that green barn! Such a beautiful ride, thanks for letting us tag along. Thanks for the ride...that was fun, even as crowded as it was...LOL! What beautiful countryside in your part of the world. I love the green barn so the colored shot would be my favorite of the two, although the black & white was also very nice! Thanks for you beautiful photos. I enjoy tem all! What is our world beautiful! I love the birch trees! Wow! What beautiful photos. You are an excellent photographer.